Has there ever been a time when you felt betrayed by your body? Or perhaps when you felt it let you down? Have you ever been angry at your weaknesses? These last couple of weeks have left me feeling exactly that way. I rarely get sick. In fact, I can’t recall the last time I had a cold or flu. I work around sick children all the time, and have a pretty strong immune system. Recently, when illness struck my oldest son as we left for spring break, then a couple days later my youngest, and then my husband, I just knew I’d be fine…until I wasn’t. Then, would you believe, I was the one who got it the worst? I developed not only a bad case of full blown pneumonia but within a week I returned to the medical center having hit a wall in my recovery, only to be diagnosed with the flu on top of it. I thought I was invincible…after all, I’m the do-er…the mom, the wife, the friend, the counselor, the Doctor, the boss, the provider. There’s no time to get sick. These last couple weeks as I have fought for my very breath, I have found there’s no time but to rest. My head has wanted to do…to celebrate my son’s birthday, see patients, to fight for the insurance pre-authorizations on behalf of my patients, to answer emails, to finish book edits on my soon to be released book “Hope Prevails”, to attend Bible study, to mentor my girls…the list is endless. But God’s call and the doctor’s warning has been two-fold: to rest and to stay calm. Can I tell you, that for this can-do, always on-the-go woman, just about anything else would be easier… until you have no breath and just moving, or talking, robs you of breath, forcing you to rest. 1. Trust that God will use all things for your good and his glory. 2. The world goes on without us. It does not all depend on us. I don’t know about you, but it can be so easy to get wrapped up in the doing; thinking it all depends on us. But as I have been on forced bed-rest, I have found that’s a lie. It doesn’t. The world goes on without us. And the most amazing thing? He’s the one who makes it all happen. He’s the provider. He doesn’t even need us–He just allows us to partner with Him in His ministry. 3. Sometimes God allows our bodies to fail us so we can rest in Him. And while it is His desire that we would be in health and prosper even as our soul prospers (3 John 1:2), sometimes He will allow our bodies to fail us. Sometimes we need a wake-up call. Sometimes we need a rest. Sometimes we need to get back to what’s really important and rest in Him. 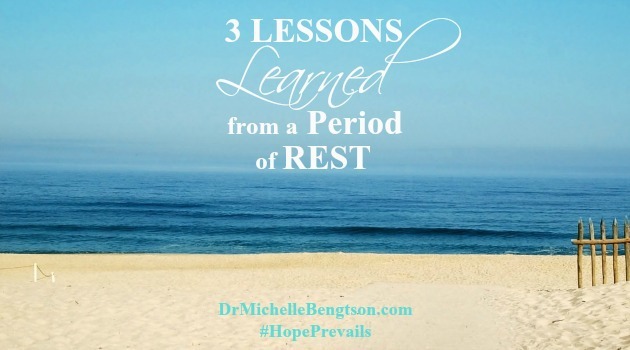 Sometimes #God allows our bodies to fail us so we can #rest in Him. Beloved, will you rest in Him today? I have been learning this lesson as well! Extra challenging for those of us that are doers! Learning to rest, receive, and remember that He has everything in His hands! Glad to hear I’m not alone Marvae, but sorry to hear that this probably means you’re in the trenches or the fire or the valley too. It’s a challenge, but if it’s from the Father, it will be for our good and for His glory. Because of Him, #HopePrevails! While I would not call it fun at all, I have learned some very powerful and sweet things through this process that I am certain I would not have learned any other way. God really does know what He is doing which motivates me to keep on depending on Him! He certainly has things for us to learn, and if nothing else, He can use all things for our good…even the sick times. We’ll slow down and encourage each other along the way!! Thanks so much for those prayers! Because of Him, #HopePrevails! Amen! I am sitting here smiling as I was reading your post. I think the Lord is trying to get out attention on this subject. I wrote a four part series on rest that started this past Friday. Happy to be visiting as your neighbor at the Linkup at Good Morning Mondays. Pam, I wish He didn’t have to go to such extremes to get my attention sometimes, but then, that isn’t His fault, is it? Glad to hear I’m in such good company. Hope you are a quicker learner than I have been. But I know this lesson will be worth it. Because of Him, #HopePrevails! I know what you mean!! I am grateful He is such a patient pursuer!! Not sure I am a quicker learner, but now in retirement I have fewer excuses!! Oh, so sorry for such trials, but God surely wanted you to take care of you..It’s a reminder how we’re not in control! God is! My husband had pneumonia during Thanksgiving vacation..we had to leave a glorious cabin..the pneumonia lasted a month! So I really feel for you!!.. and my son had bronchitis for a month the month before and on his 18th birthday. I didn’t get sick, but the care taking of two men was just as bad! I pray you have rested and are on your way to restoration with reminders that God is the one in charge. Boy do I have learn that everyday! Blessings from #raralinkup nextdoor! I was struck with another way that the Lord is using your sickness, to testify to your blog readers of His faithfulness in all the ways you outlined which has brought Him great glory. I hadn’t been sick in almost two years, and probably 10 years since I had a stomach bug. Well, last month I was struck with TWO stomach bugs in a span of two weeks! Both times I was in bed an entire day, and the second time knocked me for a loop for days. But I found that I actually appreciated the “excuse” to just relax and enjoy my time of rest. I think the Lord allows that sometimes to refresh us doers, “even in sickness” to go out and do the work He has set aside for us to do. I can remember having asthma with pneumonia and it can be a very scary and frustrating time. Praying you feel better soon. God definitely has a way of getting our attention, doesn’t he? I love the lessons you shared today. You’ll be back to doing again in no time. But for now, I’m glad your enjoying your rest! =) Neighbors with you today at Titus 2 Tuesday. I am sorry to hear that you were so sick. What a challenge but what timeless and valuable lessons you took from that time. I completely understand the desire to keep going – especially with a house full of teenagers these days. I need to learn the art of resting, as well as letting others care for me. So hard to do but so important to learn. Praying you are recovering well. I hope you’re starting to get better! What an ordeal – and a hard way to find some rest. Take it easy and let yourself fully recover. What lessons to learn through it all. Michelle I’ve had to learn that lesson several times and I know how hard it is for you sweet lady. I pray this morning you are doing better. I walked through three months of that years back with an inhaler and several other times with toxemia and pregnancy. Hang in there. This too shall pass and I know God is teaching you a whole lot through this ordeal. HUGS! So hope you are on the mend and feeling better Michelle– but praising God for your rest and review of the word– He definitely used you to encourage me as the words and verses you quoted here have been falling all around me the past few weeks. Rest has always been in His divine plan for us… ♥ Blessings from your neighbor at Holley’s link up today! What?! The world goes on without us? Oh dear. There goes my life philosophy! 🙂 Seriously, good words for me today! Rest doesn’t always come naturally for me, but I’m always glad when I do it, despite trying to convince myself otherwise! Thanks for linking up at #ThreeWordWednesday. Certainly not the way we want to spend our days. Yet it is such a reminder that we are frail & He knows that. He knows best what we need and somehow, He always works it all into His plan in ways which astound us. May He bring you strength & health as you wait on Him! Yikes! Hope you are feeling better and taking care of yourself! Those days of forced rest can be freeing and suffocating all at once.